Long time, no post on this blog. Apologies for that, I’ve been very busy – but then, that’s everyone’s excuse for not doing something isn’t it? In an attempt to be less busy, or rather, to concentrate my time more wisely, I’ve been changing the way I use Outlook for email. I thought I’d share it here if you’d like to do the same in 2011. Email is the burden of the modern office worker. We often feel controlled and dictated to by what drops into our inboxes. 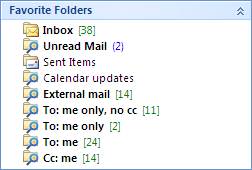 I hate that, so here’s what I’ve done in Outlook to improve my management and processing of email. But there’s so much to cover I’ve had to split this across more than one post. So here’s the first part. Take a look at my Favourite Folders; 7/9 are Search Folders. 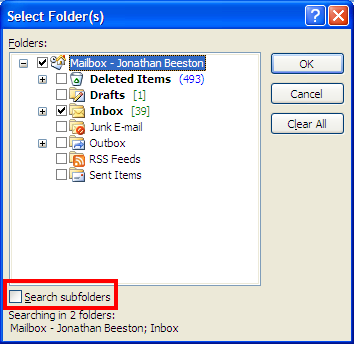 I use Search Folders to segregate the email in my inbox, without actually moving files to different folders. Unread mail: This is a default option at the top of the Search Folder dialogue box. Easy. I only want the Search Folder (and the others below) to look directly at my inbox, and not any sub-folders I may have created. Do this by right-clicking on the Search Folder and selecting ‘Customize this Search Folder…’. Hit Browse from the subsequent dialogue box, then uncheck the ‘Search subfolders’ tick box. To: me only, no cc: These are the emails that have to me only. No one else is on the To or Cc line, therefore if I don’t respond, no one will. To create, select ‘Create a custom Search Folder’, the last choice on the New Search Folder dialogue box. Name it, then click ‘Criteria…’. On the Messages tab, check the ‘Where I am:’ box and select ‘the only person on the To line’ from the dropdown. 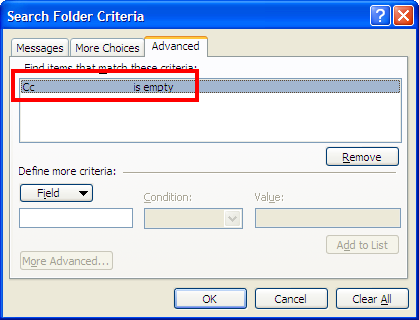 Then on the Advanced tab, select the Cc field (under Address fields) and set the Condition to be ‘is empty’. Add the criteria to the list and click OK on all the open dialogue boxes. To: me only: Remember folks, it’s not who you send email to, it’s who you cc that counts! With these kind of emails you’re being asked to do something in public, so don’t ignore them. Creation is simply, follow the instructions for the Search Folder above, just don’t create the Condition on the Advanced tab. To: me: These emails are sent to me, but not just to me, others are on the To line. Fortunately, the ‘Where I am:’ dropdown mentioned earlier anticipates this. Select ‘on the To line with other people’ and you’re done. 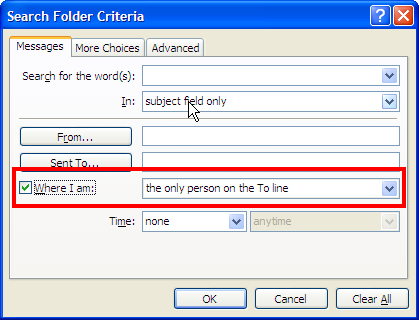 The only downside is there’s overlap with the ‘To: me only’ folder, as Outlook will still include emails where I’m the only person on the To line. I’m not sure if there’s a way around this ‘feature’. Cc: me: Finally, the least important emails – the ones where I’m cc’d. Again, this is easy to create. Just select ‘on the CC line with other people’ from the ‘Where I am:’ dropdown. Calendar updates: This is where it starts to get tricky. Often the emails I want to process first are calendar updates (invites, cancellations etc) so my diary is up-to-date. Defining those is less than obvious, but there is a way. 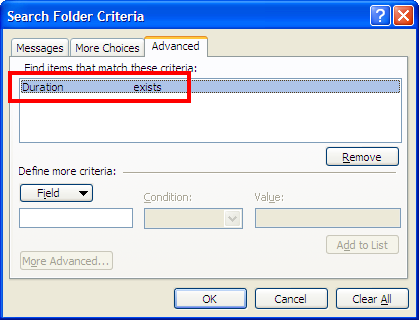 Create a new custom Search Folder and bring up the Criteria dialogue box. Then from the Advanced tab select the ‘Duration’ field (under ‘All Appointment fields’) and set the condition that it exists. Only calendar items can have this particular field, so that’s how you identify them. External mail: My job puts me in daily contact with customers and suppliers, so I often want to quickly see email that has come to me from outside my company. Unfortunately though, from what I can see, there is no way of creating a Search Folder that highlights external mail. So this requires a two-step process. 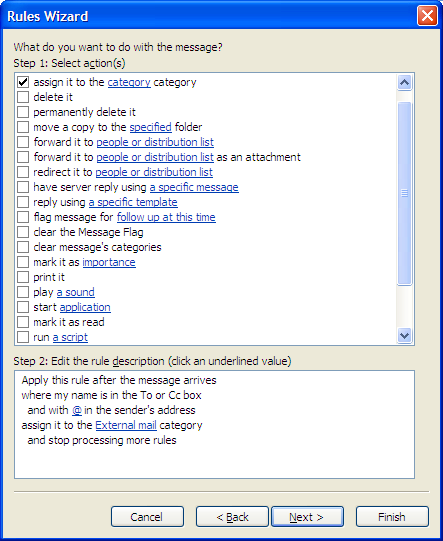 First a rule to identify external mail and categorise it, then a Search Folder that can filter emails from that category. Rules can be created by selecting ‘Tools > Rules and Alerts…’ from the toolbar. Create a new rule then follow these steps. 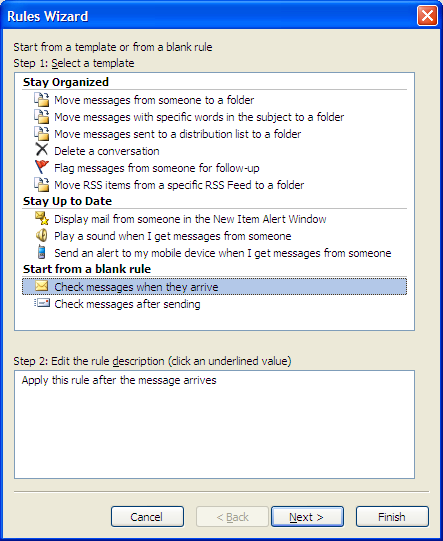 First, start from a blank rule that checks messages when they arrive. 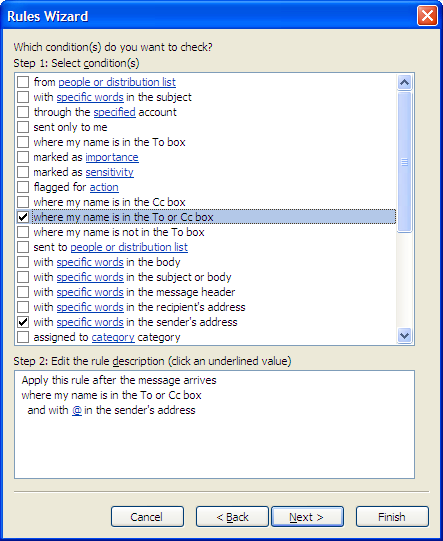 Next check ‘where my name is in the To or Cc box’ and ‘with specific words in the sender’s address’. Make the specific words to be just the ‘@’ sign. Next check ‘assign it to the category category’. Choose or create a category for this purpose. Also check ‘stop processing more rules’. 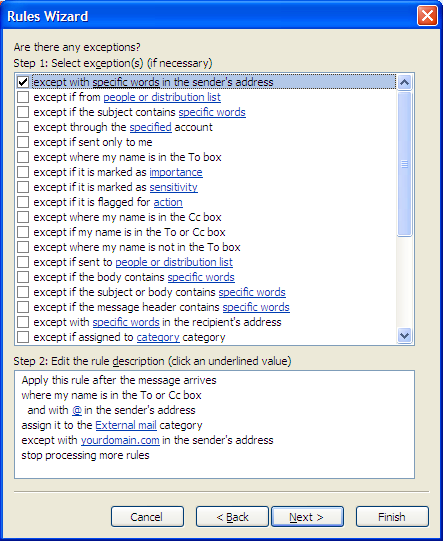 Next check ‘except with specific words in the sender’s address’ and set the specific words to be the domain that your company uses for email. In my case, that’s efrontier.com. Finish the rule up and you’re ready to go. Now if an email comes from an external domain, if will be categorised as such. If you use other rules, be mindful of the order in which those rules run. Finally, we just have to create a Search Folder that filters for this category. 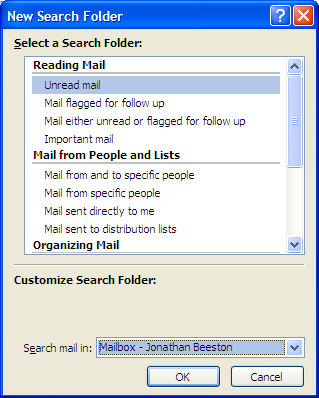 ‘Categorized mail’ is a default option from the New Search Folder dialogue box, so this is easy to do. And we’re done. Now it should be easy to filter all those emails so you can process the important ones quickly. But why use Search Folders and not rules that move the emails into different folders? First, I want the inbox to keep all the unprocessed emails together. Emails moved to folders by rules often get forgotten about. Second, I want to keep emails from the same thread together, where I may be move between the To or Cc field depending on how people reply. Third, I want to apply a little more intelligence to the way I file or discard emails and that’s the subject of part 2. Scott Hanselman for the external email rule. Microsoft for the tip about finding meeting invites. Hey, thanks for the custom search folder tips – that was exactly what I was looking for.